WINNIPEG, Manitoba -- With the Women's World Cup opener for the U.S. national team less than 24 hours away, the team is closing ranks around starting goalkeeper Hope Solo, even as it tries to block out the latest distractions from her ongoing domestic violence case. ESPN's Outside The Lines reported details of Solo's arrest for domestic violence in June of 2014. Charges were dropped last year, but prosecutors in Kirkland, Washington, have appealed to have the charges reinstated. Solo was suspended for 30 days earlier this year when her husband, Jerramy Stevens, was arrested for DUI while driving a U.S. Soccer van, in which Solo was a passenger. 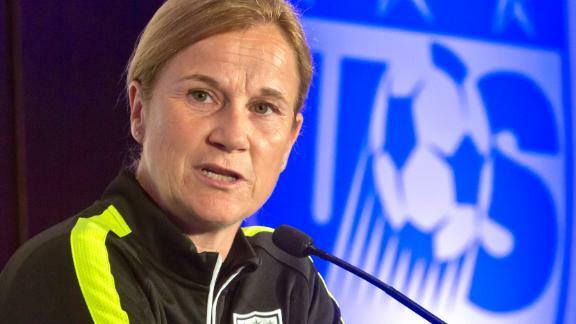 When asked about the report at Sunday's news conference, U.S. manager Jill Ellis indicated she not only hadn't read the report, but also didn't plan to, and wouldn't address the issue further with her team or with Solo. "Hope's been fantastic," said Ellis. "That [case] was a long time ago. I'll be honest, we've moved on, and she's been a fantastic player and teammate. None of that has even resonated with us, and I'm sure some of the players aren't even aware of it." U.S. midfielder Carli Lloyd has long been a close friend of Solo's and is the goalkeeper's roommate at the World Cup. But Lloyd indicated at Sunday's news conference that she and Solo didn't discuss the report "for one second." Solo has spent much of the past six months contending that she was the victim rather than the perpetrator last June and provided her side of the story in an interview with Robin Roberts on Good Morning America, as well as a detailed profile in ESPN The Magazine. That prompted one of the alleged victims, Solo's half-sister, Teresa Obert, to speak with Outside The Lines where she insisted that it was she and her son, who was 17 years old at the time of the incident, who were the victims instead. The appeal to have the case reopened is expected to take place in July after the conclusion of the Women's World Cup. While Ellis refused to reveal any aspect of her lineup, Solo is expected to start Monday's match, and the U.S. manager is confident the concentration of Solo and the team won't be impacted. "I like to have clear focus, stay in the bubble, so to speak, and worry about the things that really impact the players and the team. In here, [the report] doesn't really affect us." US women's coach Jill Ellis and midfielder Carli Lloyd discuss the details that have been reported recently about Hope Solo's arrest for domestic violence in June of 2014 and whether it is a distraction for the team.